Islamabad: Three days of fierce fighting have convulsed Pakistan’s tribal areas and exposed what tribal elders, politicians and local officials concede is the government’s lingering paralysis in dealing with the threat from Al Qaeda and Taliban militants spilling out of the region. The fighting, the heaviest in more than four years, has left at least 45 Pakistani soldiers dead as pro-Taliban militants and foreign fighters mount a vengeful campaign on all law enforcement in the area. Troubled state: The upheaval in the country underscores complaints by officials that the government has been absorbed in securing the re-election of Pervez Musharraf as President at the cost of security. The clashes come on top of months of deteriorating security after the militants ended peace agreements with the government in July. Since then, more than 250 members of the security forces have been killed in sustained attacks. The upheaval underscores complaints by a range of officials that the government has been so absorbed in securing the re-election of General Pervez Musharraf as president that it allowed the security threat to go unchecked. Even after Musharraf’s re-election on Saturday, parliamentary elections and wrangling between the president and an incoming civilian government could allow the situation in the tribal areas to drift even further, they warn. “The whole system of government is in jeopardy and the people are confused," Mehmood Shah, a retired brigadier who served as secretary of the Federally Administered Tribal Areas until 2005, said of the region. “The government is absolutely paralysed," he added. “It will take some time for them to turn the tables." Currently, by nearly all accounts, the government is caught in a double bind. After several years of trying to crush the militants, in 2006 the government entered into a peace agreement with them and with the local tribes that have hosted them. Those accords have now broken down. At the same time, the government has concluded that it cannot defeat the militants with arms alone, officials say. The public, too, is against another military campaign, which it sees as serving an American agenda, not Pakistani interests. Western officials, meanwhile, insist that if left alone, the militants and their Qaeda allies are more dangerous, because they can exploit the freedom of movement and the territory to train and plot more attacks in Pakistan, Afghanistan and even farther abroad. The lack of focus and leadership in the government has left the police, bureaucrats, tribal officials and the military reluctant to act, Shah said, even in the face of increasingly brazen assaults. Clashes are reported almost daily, he said, and the attacks are almost always initiated by the militants. The militants and their Qaida allies have taken advantage of the disarray to spread their attacks and influence on both sides of the Afghanistan-Pakistan border. The fierce fighting of the past few days, which has included bombing by the Pakistani air force, has occurred in North Waziristan, where local pro-Taliban militants and members of Al Qaeda have carved out a stronghold for themselves since 2001. And the militants continue to dispatch fighters, roadside bombs and suicide bombers to Afghanistan, according to Seth Jones of Rand Corp., who received security briefings from Nato and US forces on a recent visit there. They are also able to run an effective propaganda operation and to shelter high-level Al Qaeda members, including Ayman al-Zawahri, who is believed to be in or around the tribal region of Bajaur, he said. In no small way, the militants have sought to counter recent steps taken by the government to bolster local security forces and thereby stem the militants’ influence in the neighbouring North-West Frontier Province and beyond. In fact, the militants have increasingly expanded from their early aim of fighting US forces in Afghanistan to waging an insurgency inside Pakistan itself. Even as a bloody siege between armed militants and security forces unfolded in July at the Red Mosque in Islamabad, tribesmen mounted numerous attacks on military checkpoints and police positions across the frontier area. They then reached deep into the heart of the military and intelligence establishment with suicide bombings against a bus full of intelligence personnel and at the mess hall of a special forces camp near Islamabad on 13 September, which killed 16 commandos. Those who try to stand up to the militants face intimidation, or worse. On 15 September, Maulana Hassan Jan, a well-known cleric who was a mentor to many Taliban, was shot and killed in this frontier city after denouncing suicide bombing. The crowd that turned out to mourn the cleric filled a stadium. Yet, the mourners turned their ire on the government officials present, including the interior minister, Aftab Ahmad Khan Sherpao, forcing them to leave. Still, the government prefers to pursue negotiations with the militants rather than fight them, said Ali Muhammad Jan Orakzai, the governor of the North-West Frontier Province and a retired general. “Obviously our priority is peace, because if there is no peace there would be no development," he said in a recent interview in the governor’s colonnaded residence in Peshawar. The government wanted to renegotiate the peace agreements, introducing more stringent measures, and to win over the militants and tribespeople with the promise of a nine-year, $2 billion (Rs7,880 crore) development programme. The governor said the military would be used where required. But he expressed the hope that once local security forces were better trained and equipped, the government could withdraw the military from the tribal areas, deploying troops only on the Afghan border. 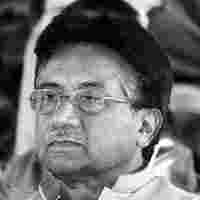 For months, Musharraf and his officials have talked similarly of the need for a comprehensive approach that involves political engagement, development and an increase in local security forces. In support, the US has pledged $750 million over five years in development assistance and is helping to train local security forces, the Frontier Corps and the Frontier Constabulary. Javed Iqbal, the additional secretary for the tribal areas, also advocates negotiation over military action. “The use of force is not going to take us anywhere," he said. Yet, the most important element—political engagement—is lacking, many in the region say. “If there is sincerity, the tribal elders and the people can mediate and find a negotiated solution to this problem," said Malik Khan Marjan, a tribal elder from North Waziristan who heads a council of elders. “But there are no talks, only fighting," he said. Marjan heads the 67-member elected council for his region of North Waziristan. In all, there are 476 elected council members from the seven tribal regions. Marjan said the government had never bothered with the council, and the council members had never met with the president, except once to attend a speech. “He did not have time to hear us," Marjan said. “We had no chance to tell him what we think. Things are deteriorating and there are no decisions, no consultations." Ismail Khan in Peshawar contributed to this story.